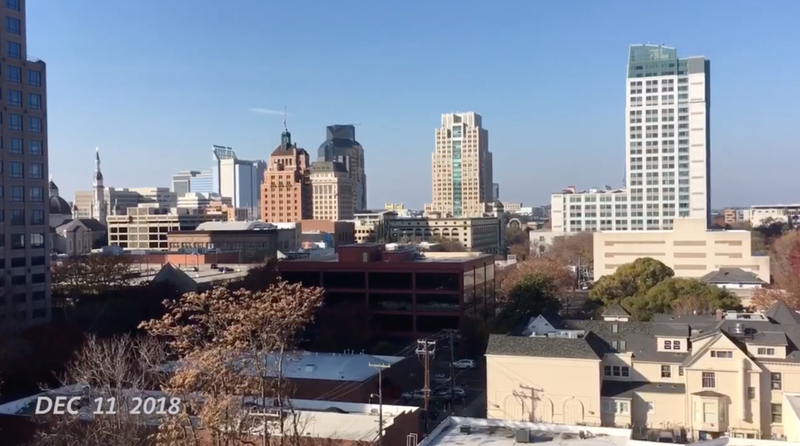 December included: Christmas entering my living room, Christmas trees in windows downtown, rain boots and ginkgos before therapy, more Christmas explosion, “15” on level 8 of the parking garage after work, completed Christmas while watching the baking show <3, walking through the “Fab 40’s” in East Sac with Becca, Lili, Lydia, and Rory, bed scenes, gingerbread assembly, breakfast light, Sacramento from my parking garage as I arrive + as I leave, Buddha while I walked to get my bike to work, steam coming off my back fence, holiday earrings and pin, a neighbor’s festive front doors, the light on my way to yoga, my landlord put up lights!, drying orange slices for winter solstice, my tree from outside while it rained, a grocery store sunset, driving to my parent’s via the back way, my Dad and sister as we made foil dinners on the fire pit, Christmas in both neighborhoods, car flowers (I want to remember that I drove back and forth the week between Christmas and NYE for work), car pizza from The Cheese Board in Berkeley, The Paramount Theater in Oakland before Straight No Chaser with my family, pancakes via my Dad, midnight viewings of Taylor Swift’s concert on Netflix, and a NYE showing in our matching pajamas with my Mom’s two trees. Look out for 2018’s entire video in the coming weeks! I've idolized Christmas cards, for as long as I can remember. I recall lovingly opening up the envelopes my family received and excitedly reading the updates from the senders. The designs, the handwriting, the effort! Now, we get news throughout the year via text messages, Facebook, and Instagram, but I think this makes the holiday cards people send nowadays all the more special. I also have a deep love for traditions and enjoy starting my own as an adult. Last year, was the first time I felt close to “getting” to send out a holiday card myself. I was old enough, on my own enough, and committed enough to another person. But of course, things changed. (That’s a gracious way of saying that everything fell apart.) And this year, I could have easily let myself feel discouraged and talked out of sending a card, despite feeling so ready last year. But instead, I decided to send out a solo card. And that felt a little silly at first. But truthfully, I am just me right now. I thought about it some more and realized I'm not an island. I have an amazing support team that carried me through 2017. In both big and small ways, they cheered me on through some of the toughest days and nights I've had to face. This card celebrates all that I accomplished this year, with the help of all of them. They moved me out of the first home I built, and they celebrated Galentine's day with me. They supported my ventures into the dating world and helped craft the perfect dating app bio. They invited me into their homes, both on random Tuesday afternoons and to celebrate holidays. Together, we welcomed husbands and babies. We grieved the continued loss of my brother. We went to Giants games in the spring and set off fireworks on the 4th of July. They rallied together to celebrate my first birthday as a single woman. They texted and they called. They loved and they showed up. They showed up, and they stayed around for me. To the people that saw me through 2017, the trickiest year yet, thank you! May 2018 bring continued growth, tons of self-care, and more joy than we know what to do with. All professional photos taken by Christina Best Photography. The holiday card is from Mpix. 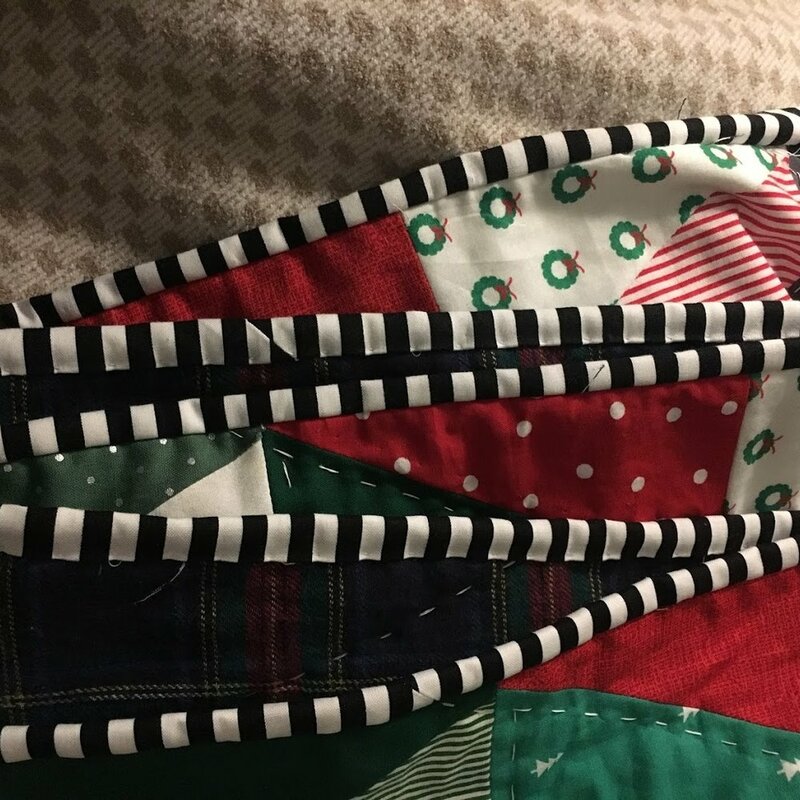 THE TWELVE STEPS OF CHRISTMAS QUILTING. STEP ONE: Gather inspiration. 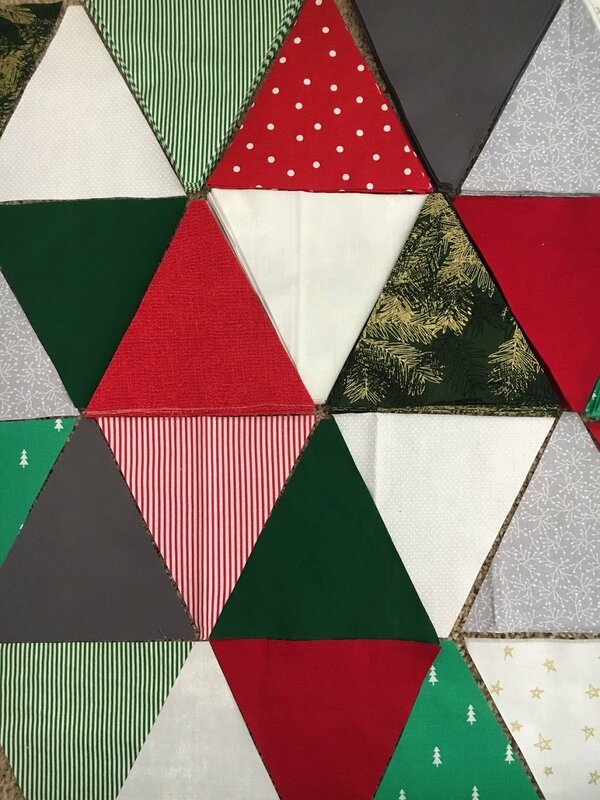 I'm constantly being inspired by the craftiness of Instagrammers like @elisejoy (she's done two+ Christmas quilts over the years that contributed to mine) and online quilters like Emily Dennis of the gorgeous QuiltyLove.com (her Scrappy Triangle tutorial can be found here). STEP TWO: Buy fabrics. This required no less than a dozen trips to Joanns over the course of four weeks. This is a normal part of the process and eventually became enjoyable. If you're lucky, the employees will even begin providing feedback on your selections! STEP THREE: Cut! 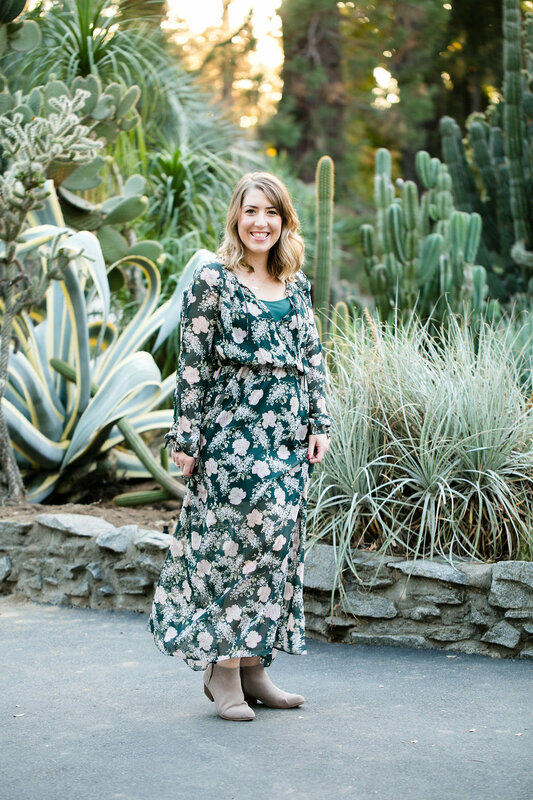 Cut, and cut, and cut your fabric choices. These are the tools I used- rotary cutting set and mat and tri-tool. 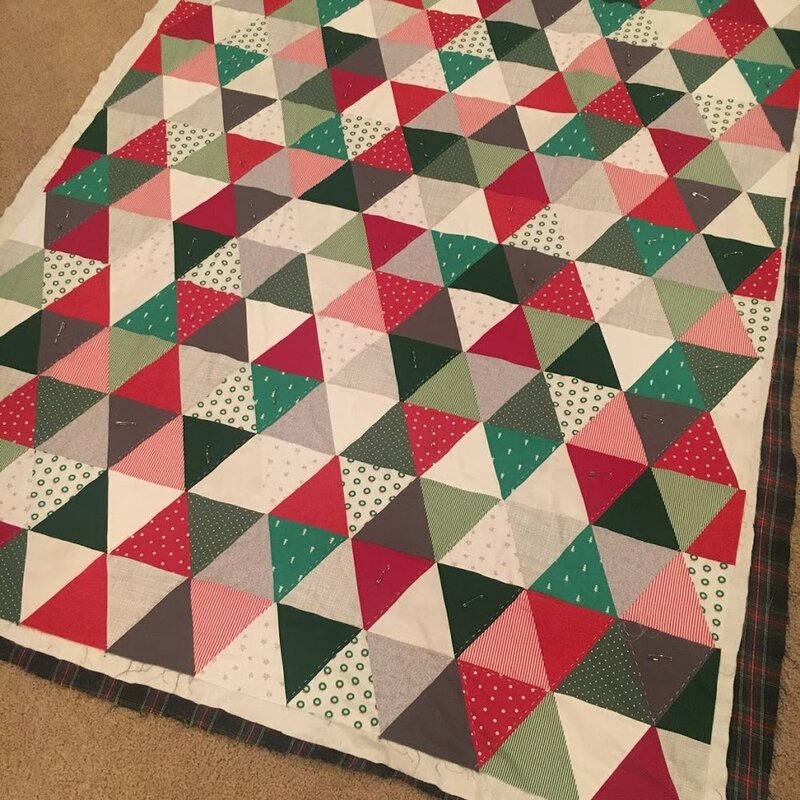 I tried my hardest to make the triangles as even as possible because I've learned that cutting is make it or break it for a quilt. Set yourself up for success by cutting precisely! STEP FOUR: Layout your pieces. This took a lot of trust. Let yourself switch colors around, but eventually move on. It's easy to get stuck on this step and it doesn't serve you! If something drives you crazy later on, you can always change it's placement. Once I decided on my final layout, I stacked the pieces to the left and sewed together in horizontal rows. STEP FIVE: Buy more fabrics. It was tough deciding when enough was enough. I love the late addition of the silver grid fabric and can't imagine the quilt without it. STEP SIX: Sew! Somehow I don't have any photos of this all important step. Eventually, after many hours of sewing I ended up with a completed topper! Do all my points match up exactly? Absolutely not. My favorite quilting mantra is, "Would a blind man on a galloping horse notice?" I tried to get pieces to match the best I could, but also didn't let it stop me from making the thing. I figure that practice makes better and with time I'll get better at my seams matching up. Until then, I'll keep quilting! STEP SEVEN: Baste! I used this spray baste and a generic batting from Joanns. I used safety pins as my guide for hand quilting. STEP EIGHT: Quilt. I hand quilted all the diagonal rows going one direction and added details to random triangles determined by color. 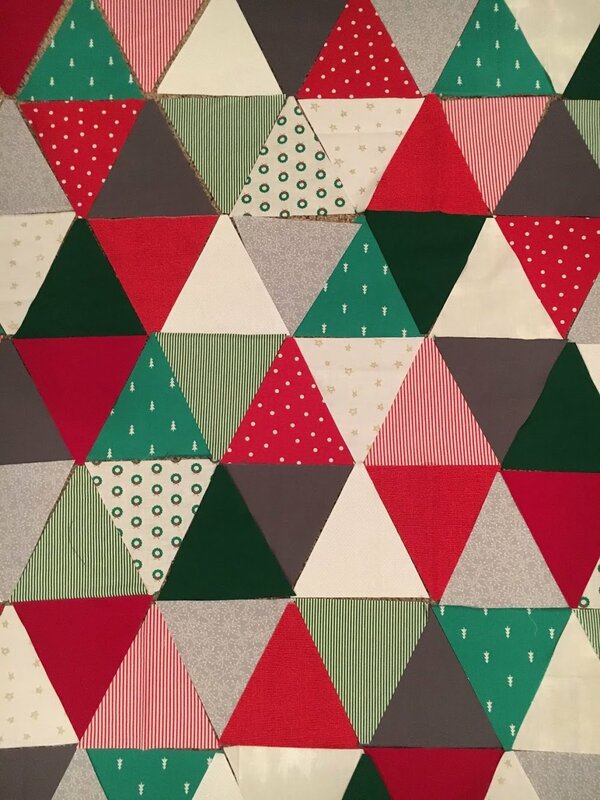 On the darker colored fabrics, where it would show up more, I quilted the entire triangle. I love how it turned out, especially the white thread against the navy flannel of the backing. STEP NINE: Bind. I used the black and white striped binding from SoBiased via Etsy. Many nights were spent hand binding in bed (I machine stitche the front, then hand bind the back with an invisible stitch). STEP TEN: PHOTO SHOOT. Have a picture taking adventure with a photographer and location of your choice. I chose a nearby Christmas Tree lot with my sister. Thanks Melissa! STEP ELEVEN: ENJOY! Snuggle up with the fruits of your labor. 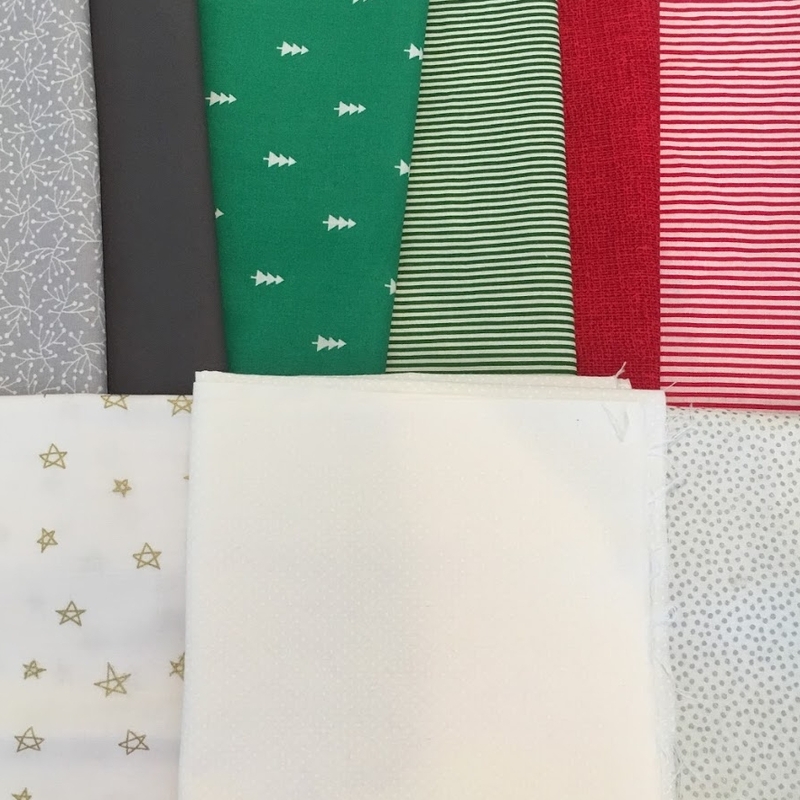 STEP TWELVE: Begin dreaming about next year's quilt addition. 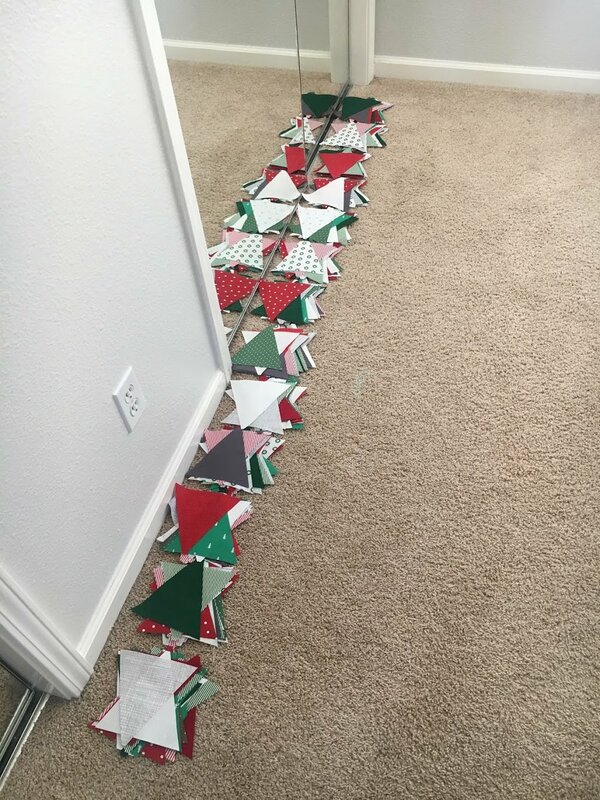 Trees, hexies, and Christmas joy are all contenders for now.